Monday February 22nd 1926 I got lunch early and went to the city. Phoned Mattie Stitt and Mrs Della Potter. I afterwards went out to her house. Late I looked for a fur neck piece. Ott & Mrs Eavens home before I was Tuesday February 23rd 1926 I left home with Miss Eavens. I got on the 9.05 Bus for San Bernardino to see The Orange Show. A beautiful ride and wonderful arrangements to see. Was delayed coming back with change of Bus. The girls came home after I did. They brought me letters from Cora, Warner McCall, Will Anderson and Hattie in which she enclosed others of interest. My hat came too. Wednesday February 24th 1926 I wrote to Hattie and went down town before lunch. I bought a new fur piece at Bullocks. Early in the afternoon went out to see Mattie. After I came in went up to 1626 1/2 to find Ott gone. I came on alone. Letter from Bro Ott, he goes home today. Wrote W B M---. 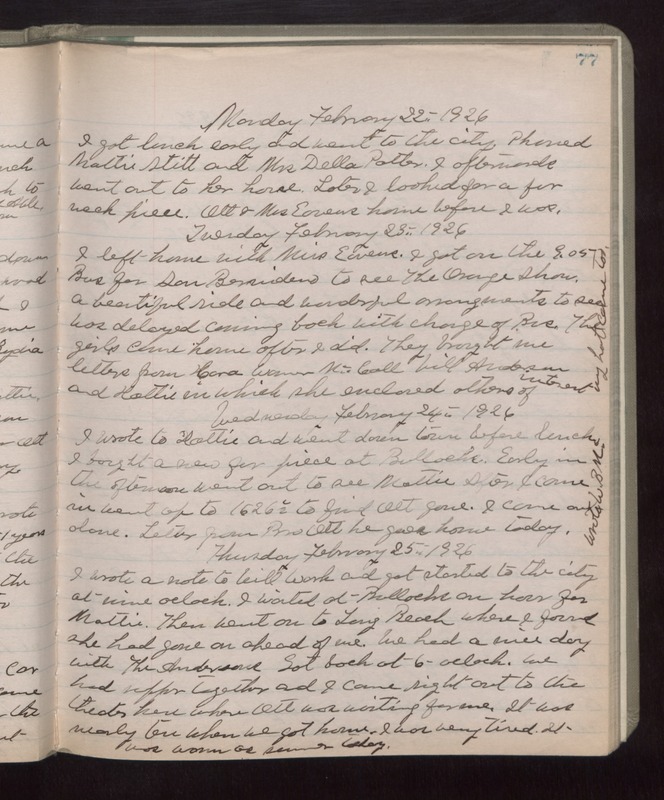 Thursday February 25th 1926 I wrote a note to Will Work and got started to the city at nine oclock. I waited at Bullocks an hour for Mattie. Then went on to Long Beach where I found she had gone on ahead of me. We had a nice day with The Andersons. Got back at 6 oclock. We had supper together and I came right out to the theater here where Ott was waiting for me, It was nearly ten when we got home. I was very tired. It was warm as summer today.